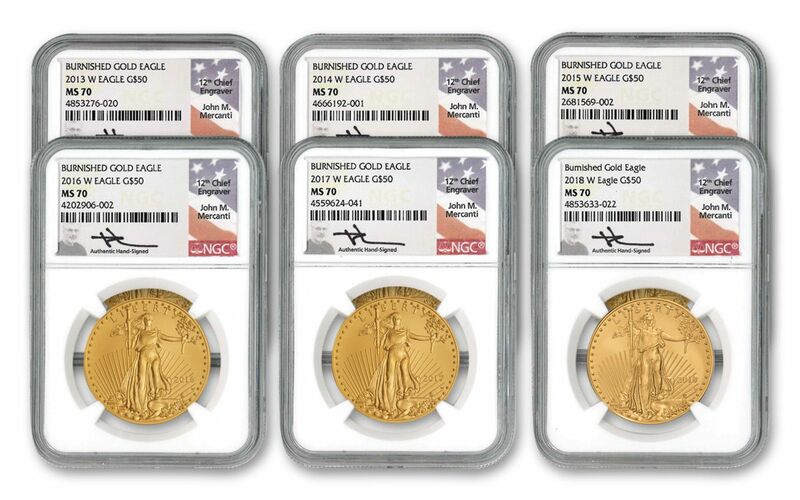 Complete, Flawless Burnished Gold Eagle Collection Signed by John Mercanti – One-Of-A-Kind! 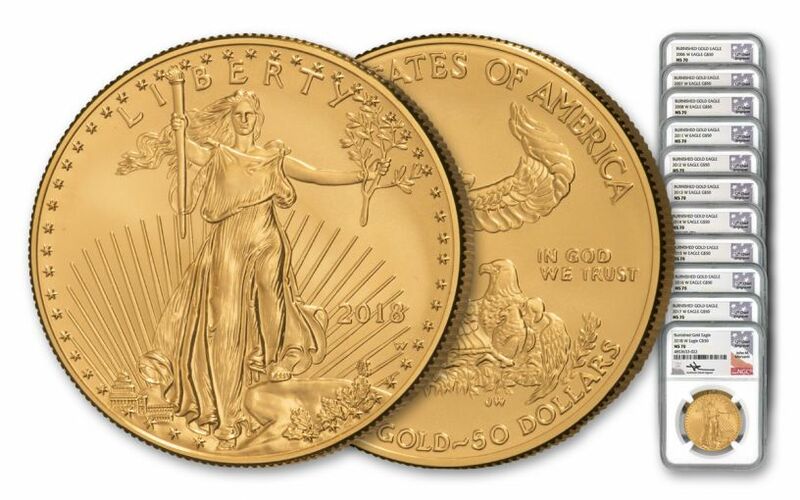 The U.S Gold Eagle is one of the most popular gold coins in the world. Hundreds of thousands are struck each year and quickly gobbled up by both bullion buyers and collectors. But there’s a more elite version of the coin, struck in 42 times fewer numbers than the bullion Gold Eagle. That coin is the Burnished Gold Eagle, struck with a smooth, matte-like finish. Only 11 dates of this coin exist, each struck with mintages that rarely break 10,000 coins. In fact, if you add up every Burnished Gold Eagle ever struck, you would still have fewer coins than any single mintage of bullion Gold Eagle. They’re that scarce! 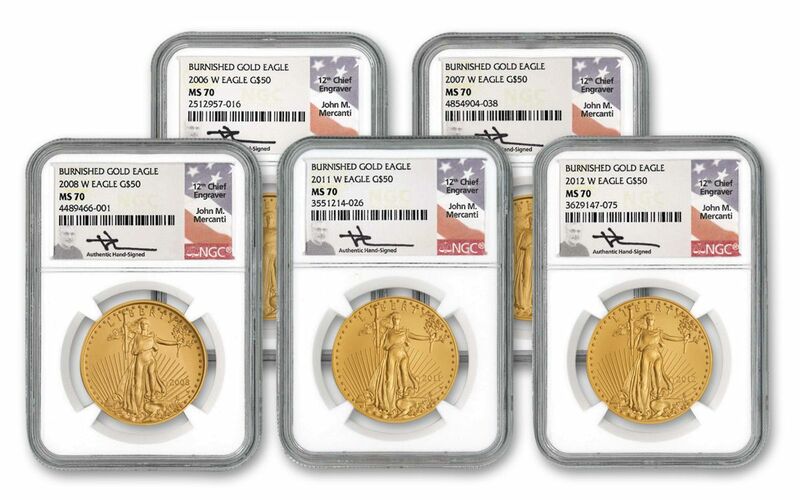 In the entire collecting world, there is only ONE complete 11-coin collection of Burnished Gold Eagles certified by NGC as flawless Mint State-70 (MS70) condition, with labels hand-signed by John Mercanti, 12th Chief Engraver of the United States Mint. This is that set. You’ll be the only person in the entire world to own all 11 dates—meaning 11 Troy ounces of highly-pure 91.7% U.S. Gold – all in perfect condition, and all bearing Mercanti’s signature. It’s an elite set that belongs in only the finest collection. This one-of-a-kind collection is ready and waiting in our vault. Get it now before someone else beats you to it! THE ULTIMATE SAINT-GAUDENS CREATION . 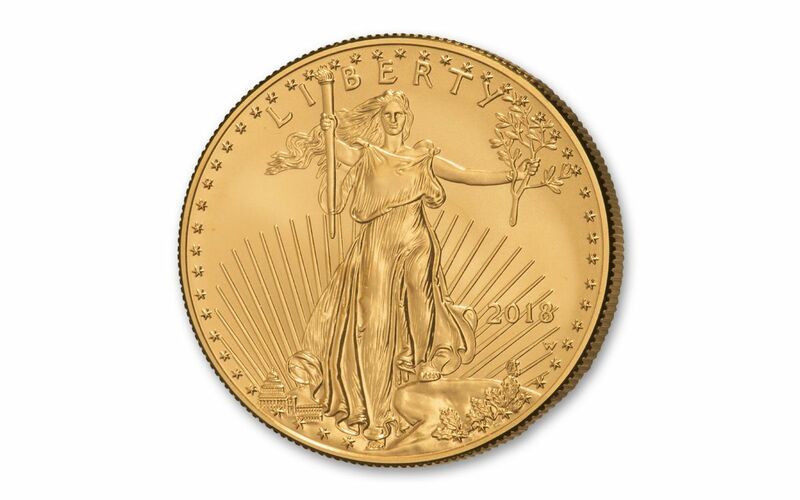 . . – These One Ounce Gold Eagle Proofs exhibit a stunning design of Lady Liberty walking forward with focus and purpose, torch in one hand and olive branch in the other. Originally introduced on the famous 1907 $20 Double Eagle and born from collaboration between Augustus Saint-Gaudens and Theodore Roosevelt, this design reveals beautifully intricate details (like the U.S. Capitol building in the distance) with each viewing.
. . . PAIRED WITH A PATRIOTIC FAMILY! – Featuring a male bald eagle carrying an olive branch to his family, sculptor Miley Busiek's design for the reverse continues to serve as a perfect modern companion to Saint-Gaudens' vision. EXPERTLY STRUCK IN HIGHLY PURE GOLD – Each Burnished Gold Eagle is created from specially prepared 22-karat (91.7%) gold blanks that give each coin a distinctive smooth, matte-like surface, as well as razor-sharp details and blazing luster. 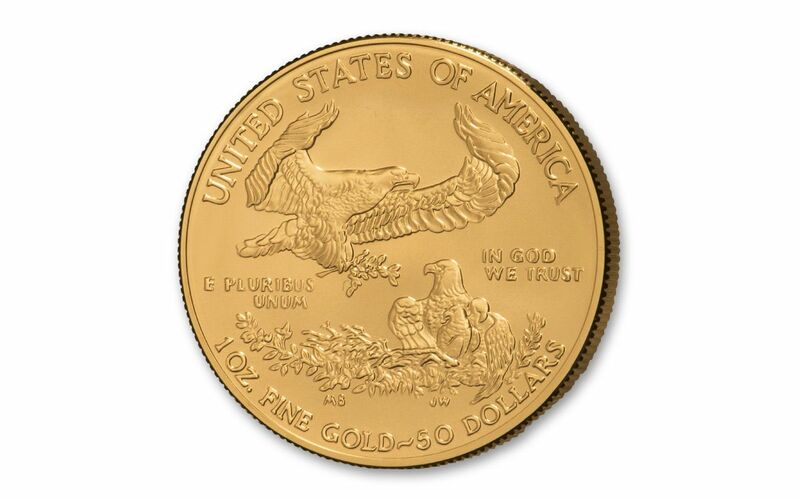 U.S. LEGAL TENDER – Minted in gold mined in the United States with weight and content guaranteed by the U.S. government, each One-Ounce Gold Eagle is $50 U.S. legal tender, as seen on the coin's reverse. GRADED IN PERFECT UNCIRCULATED CONDITION – Your Burnished Gold American Eagles will come graded by the Numismatic Guaranty Corporation (NGC) as being in perfect Mint-State-70 (MS70) condition, a distinction that means your perfectly-graded coins will have ZERO imperfections – showing all features and fields exactly as the engraver and mint intended! AN AUTOGRAPHED LABEL! – The labels encapsulated with your Burnished Gold Eagles display another phenomenal feature – the autograph of John Mercanti, the 12th Chief Engraver of the U.S. Mint!